Old with the new. 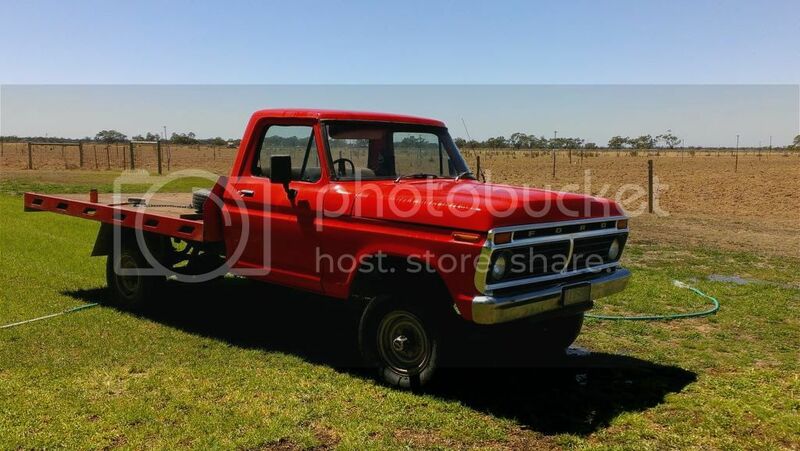 74 F250 High boy. Powerstroked. The new project is under way. 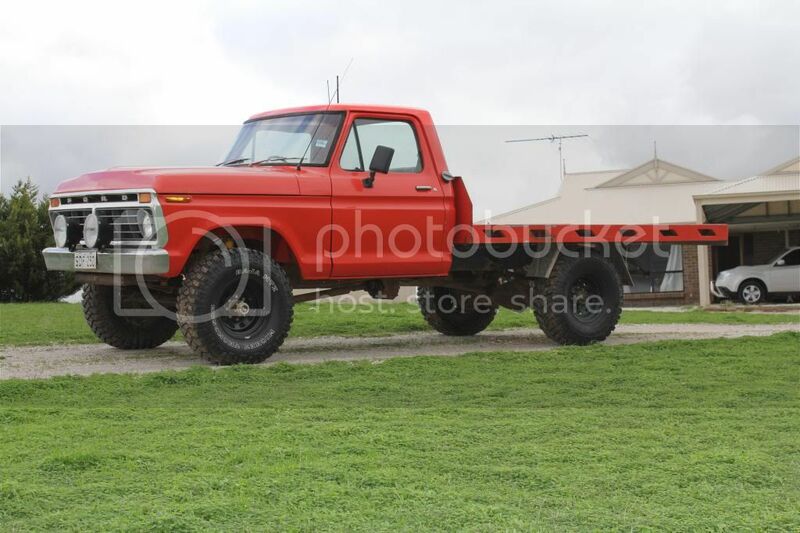 I have a 74 F250 high boy (4x4). As it stands it has the old 300 ci Canadian six in New process 4 speed and un married transfer case with Dana 60 rear and dana 44 front diff. I have a written off (cab fire) 06 F250 4x4 that's running gear will be ending up in the high boy. The 06 is a 7.3 power stoke. 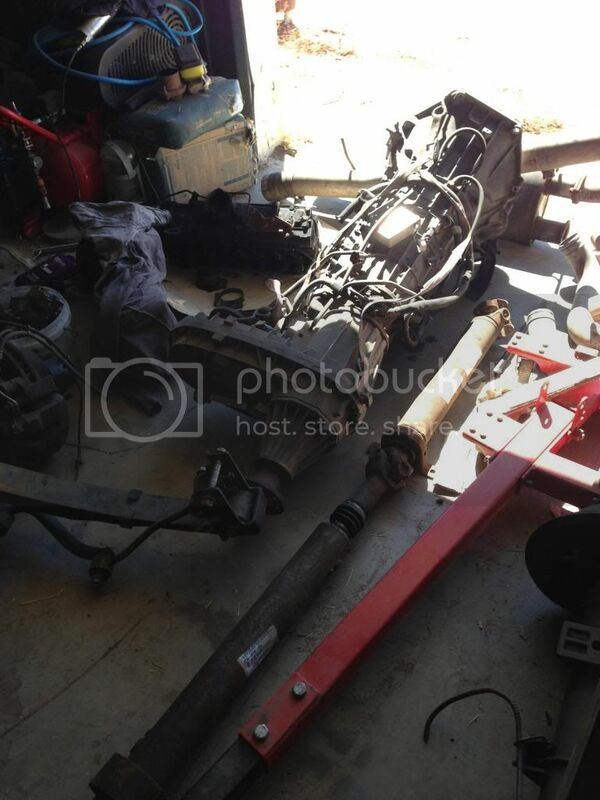 4R100 auto with sterling 10.25 rear and dana 60 front diff. Should be a good fun truck once finished. I have started cleaning up the cab. Its not in bad condition for its age. 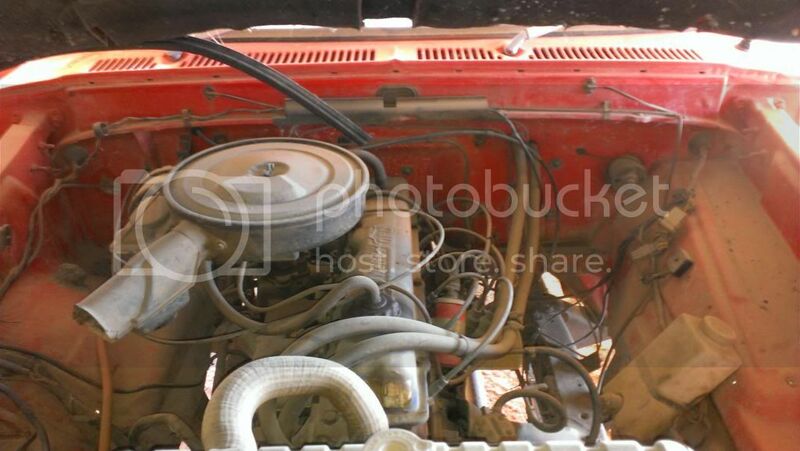 So far all I have done to it is a set of 315 75 16 Mickey T MTZ's. Which i love. Awesome in the mud. Just given the cab a good buff and polish and started ordering all the bits and piece's I will need. Won't be a 5 minute build, got alot of work ahead of me. But hoping to try and have it on the road by this time next yr. Fingers crossed. The day I picked the old girl up. Re: Old with the new. 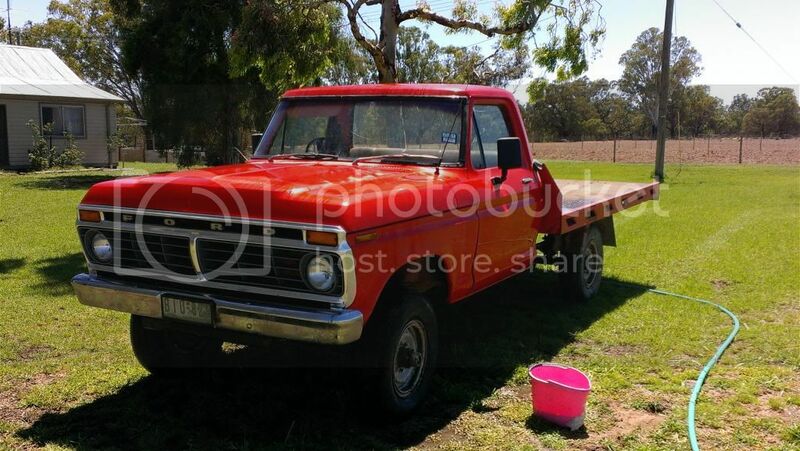 74 F250 High boy. Powerstroked. Now that will be a great conversion! Should be pretty straight forward as far as rego legalities go too. 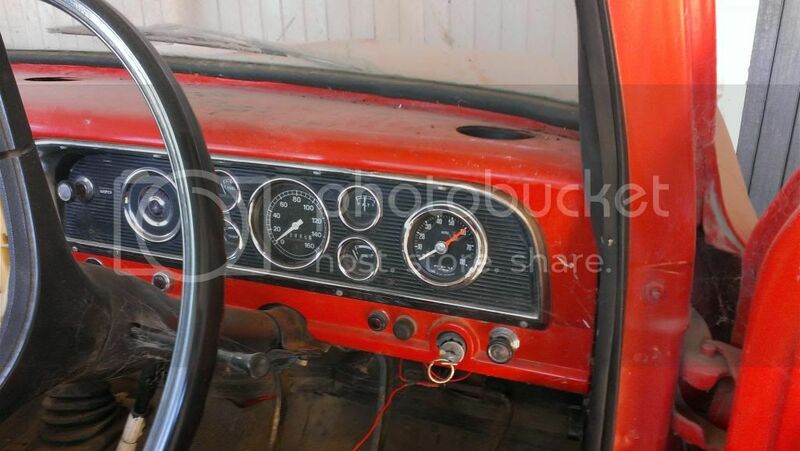 The hardest part will be grafting in the new instrument cluster and keeping it looking like old. There's a lot of electrics to deal with but it'll all be worth while and you'll have a great capable rig that's easy to live with. Worth restoring the cab with all new rubber seals and under-felt etc to make it like new again. Good luck with it. Awesome! 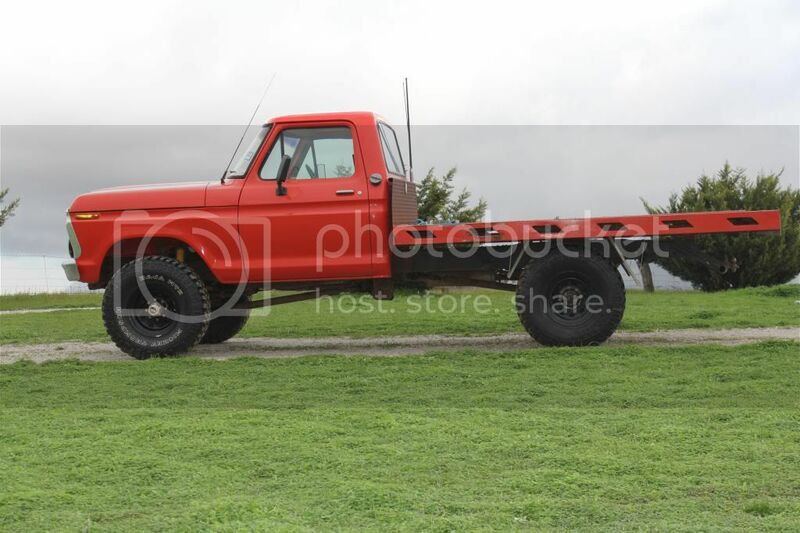 I love the look of the old trucks! Should be a great build! This is going to be one hell of a build up can't wait to see it progress . Keep the progress reports and pics coming. Got a huge great big box at home with all new rubbers. Reso mat, new carpet and under felt already. SA Reg department are interesting to say the least and are making it a little difficult. They don't like the fact that the new diffs are 3" wider than the original one's. The fact that they are disc and abs doesn't seem to matter. Go figure. ???? 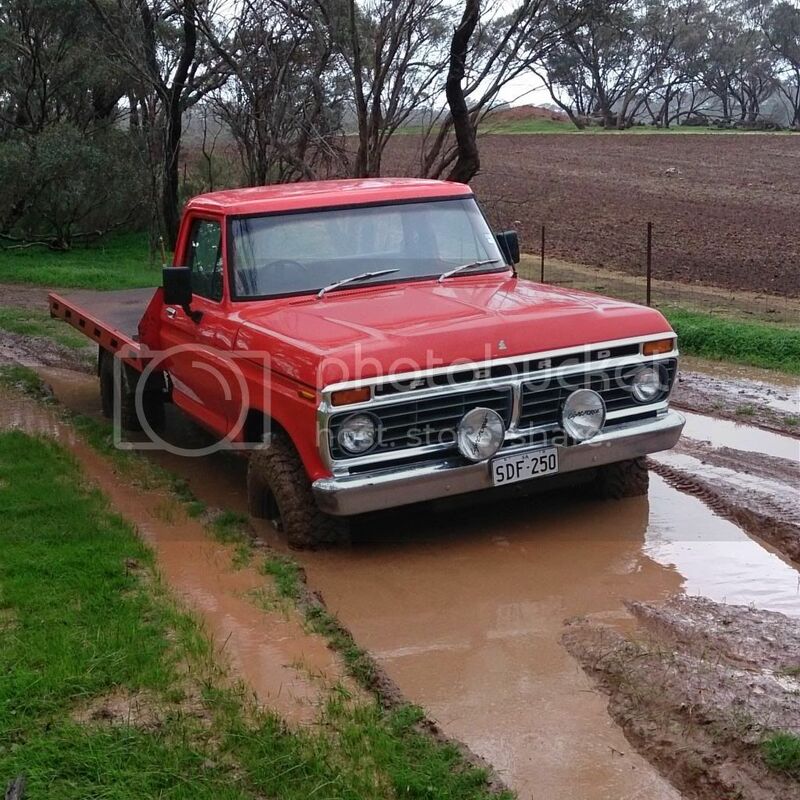 Got a good mate at home that has his own auto elec business and he has basically figured out how we can make it all work and keep it looking as original as possible. But that part is a long way off yet. He seems to think it will be a easy task. My brain just started spinning while he was telling me how he's gunna do it. All in all should be a good fun build. This is going to be an awesome build. Will be watching with interest. Good luck with the build and the rego. Re: track width. The important thing for SA transport to get their head around is that the track width is a result of wider axles, not by large offset wheels. What's important is that the track width is standard to the new axles. Wider track equals more stability so they should be happy with it. Besides, you're using axles with a higher load rating than the originals so there's no issue with reduced GVM or anything. 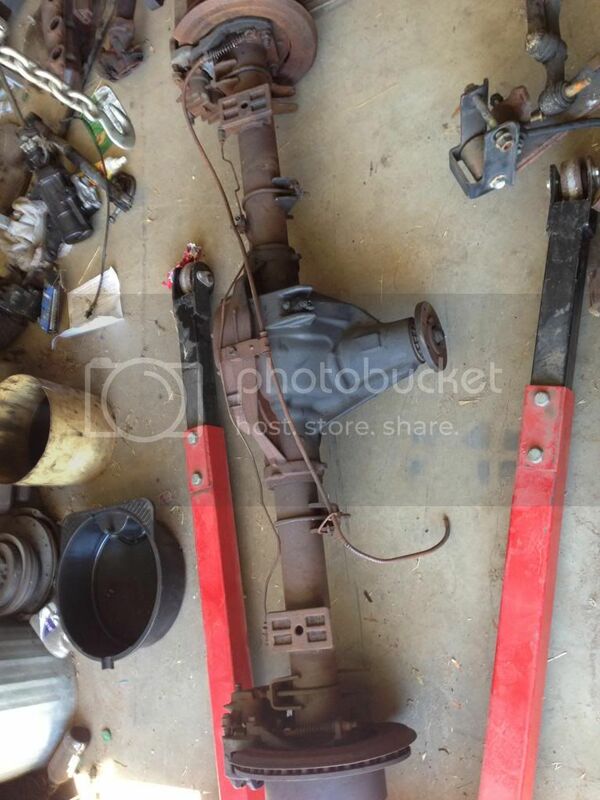 Aim to use the brake master cylinder/hydraboost unit from the newer rig too. 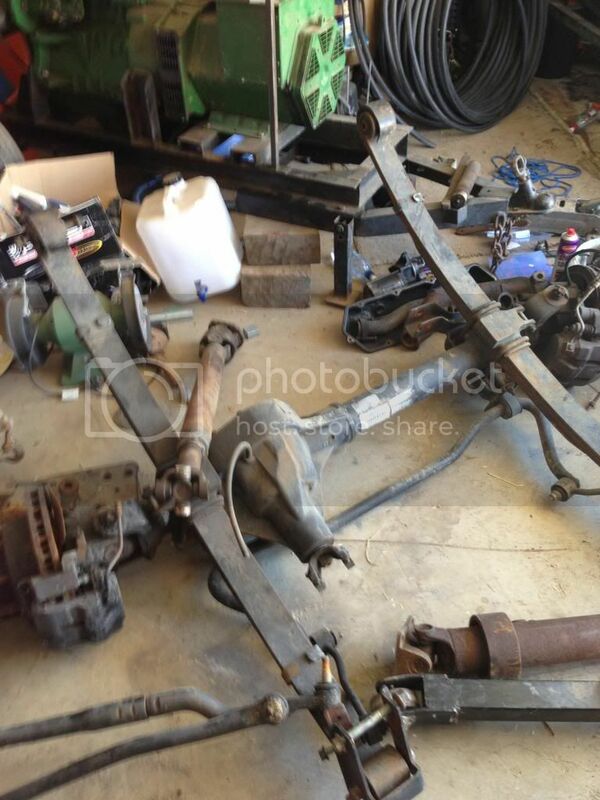 That way you're using the entire braking system and there is no doubts with miss-matched components. Beyond that all that matters is that the wheels are covered, meaning you may need to fit some flares wide enough to cover them. You would think it would all be very straight forward for them but no. I'm improving the vehicles handling braking and stability but they seem very much against it. We are the boring state down here. Yeah, what you're proposing is entirely sensible, logical, and technically superior. There is no practical reason to disallow it. (Providing the execution of the changes is done properly of course) So it would seem some knucklehead in the department is simply being obstructionist, throwing their authority about because they can, regardless of the soundness of your plans. Perhaps the matter could be taken higher up in the department. Peter Aawen might be able to provide some advice and/or contacts to move ahead with. I hope he'll chime in. If that's true then this build is the equivalent of a bag of Ghost Peppers* ...marinated in Tabasco. Can't wait for any and all updates on this beauty. bit of an update. 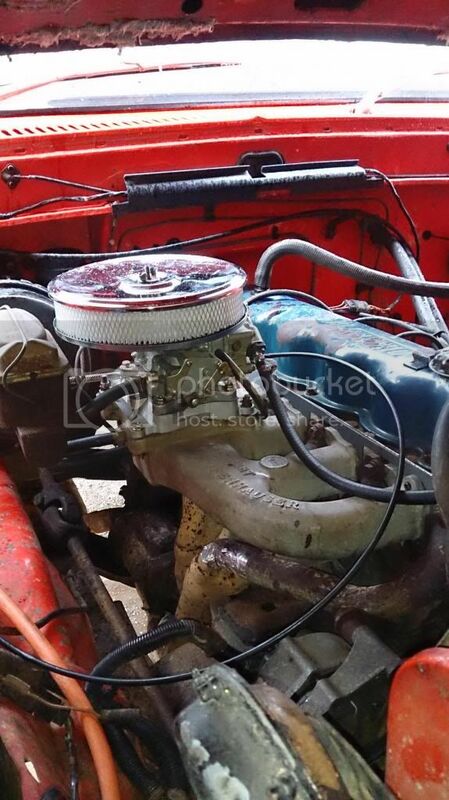 Put a 350 holley on the old Canadian 6 to give her a bit more go while I build up the 7.3. Went out to have a bit of a play in the mud and when i got back I noticed she was running a little rough. Next morning started it moved it from under the car port and not sure why but decided to check the oil and hey presto a sump full of milk. :(. Hoping its just a head gasket. Didn't get it hot or give it a big heap of berries while playing in the mud, so hoping thats all it is. The guy I bought it off of got the head rebuilt not long before I got it and who every done it forgot to tighten any thing back up. 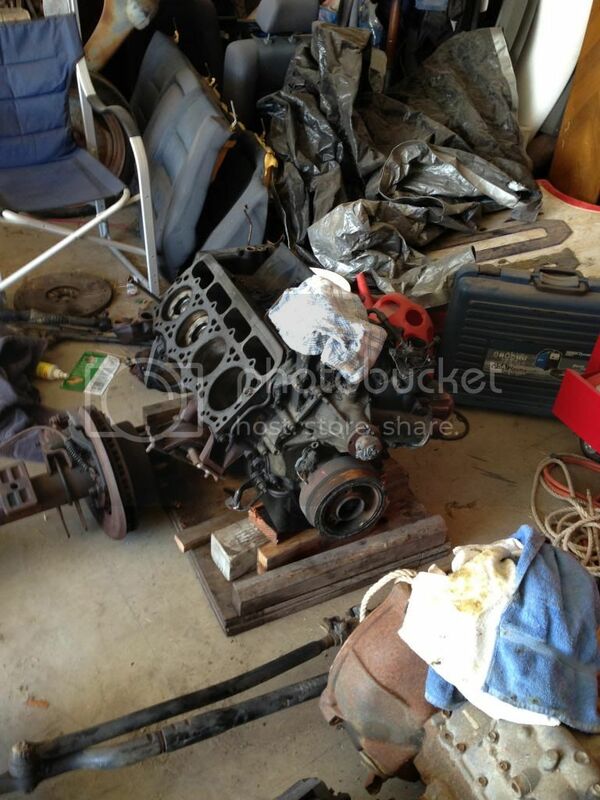 So it may even be as simple as the head was never torqued down correctly and a new head gasket could fix it. awesome build up mate. how's it all going?